In all honesty, there really are a lot of things to know and learn about autism. Clearly, after more than a decade of navigating the autism learning process, I will freely admit, I’m still learning. Lately though, as my boy is getting older, there are things I wish I’d known sooner, done differently. 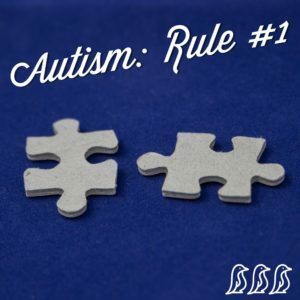 The one piece I wish I’d learned first in our journey is something I’ve come to see as the first rule of autism and the prevailing smart point. Of all things autism, this is the one I wish I’d internalized in those very earliest moments. As simple as it sounds, “just don’t fret,” might as well have been pie in the sky when my boy was two. No, you’re right, it’s not rocket science, my friends, but it’s also not always easy. Simple, yet tragically challenging as well. With all the stress surrounding the journey and the myriad of pieces and parts that we try to keep juggled in the air, not fretting can be a Herculean feat. Not falling into the pity pit can be daunting. I know, I know…don’t go preaching to the choir, right? But, really, one of the smartest strategies you can participate in on this spectrum journey is staying focused on your child and not allowing yourself to descend into the fret, into the pity pit, into the darkening levels of self doubt. That’s rule #1 and that one rule can form the very foundation for all that comes next on your journey. You’re an autism parent and you can do a lot of things. You can fight, you can grow, you can learn and you can most certainly be the change you wish to see in the world but only if you don’t go fretting yourself into a corner. Don’t round you or your child’s life off to the nearest disaster. Don’t mire yourself in the muck of the ‘what comes next’ internal battle. Be more than just the sum of your fears…be fearless, my friends. Face autism head on because as much as I know anything, I know you’ve got this. It will take time, no doubt, it will also take faith, determination and a back bone of stone but, I guarantee you, you’ve got this like a tiger by the tail. And, I will not lie to you, you’re not going to find autism in your comfort zone. No, it won’t be all sunshine and roses. No, nothing in your past will prepare you for the colors autism will bring to your life. No, there aren’t a lot of clear cut answers in the early days. And yet, still I’m telling you, you’ve got this. Rule #1, no fretting, naturally means you need to stand firmly in the here and now and refrain from that tip toe trip over into those elusive tomorrows or a quick traipsing off into the what-ifs because, with autism, staying centered and focused on the now matters when nothing else really does. Focus on the work you can do today and don’t prematurely fret away tomorrow’s energy. PERIOD. The only thing you really need to do and actually have to do is to appreciate all that your kiddo is today and don’t get your focus stuck on that theoretical cookie cutter that they aren’t fitting into. And, if you do the work you need to do today, tomorrow will take care of itself. Just have faith in yourself. Sparkle On, my friends….and just don’t fret!! I am a mom, special needs advocate, and public school teacher who believes a child’s value is so much greater than grades or numbers on a score card. In these last seventeen years navigating this autism journey with my son, I have learned that who my boy is… is exactly who he is meant to be. The reason I love, rather than fear, autism, is I see the bigger picture and how it has blessed us with a bigger view of life and a deeper appreciation and affection for different.